Fair warning, this post/recipe will be long. BUT if you stick with it, it's so worth it and you just might make lifelong friends in the process (e.g. the people you feed). You may ask why anyone would ever endeavor to make macarons. Truthfully, only somewhat insane home bakers make them once and then never again. When I make macarons, they always end up being a day long affair, I tear apart my kitchen, and I have a sink full of dishes at the end of the night. But like all good things in life, you'll be so satisfied to learn how to make them yourself and so proud when you've assembled an array of these delicious bites. They are definitely finicky, but oh so worth it. First, I have never been to France, the land of endless, beautiful, and perfect macarons. It is probably a good thing that I've never been to France. I might set eyes on a pastry or bread shop and just never leave. I may overstay my welcome and be lead out of the country overweight from pastry and with a suitcase stuffed with all manner of cooking gadgets and croissants. So, while I admit I may be flying slightly blind as to what an official French macaron should taste like, here is my ideal macaron: it collapses when bitten into, is chewy, bright, on the dainty side, and bursting with flavor. I've set my macaron baking bar, so to speak, so let's try to accomplish that. Here are some givens. Macarons are really fussy. After making them once, you'll appreciate why they cost so much at your local bakery. Dedicate a few solid hours to making them and then add a few more hours on top of that. Macarons can be made and assembled over the period of a few days, making this an ideal weekend project. The best part is if you started making these on a Saturday morning, by Sunday evening (maybe you're having a dinner party) they'll be ready and will taste even better. Not many dessert recipes get better with time. After you pipe macarons on your prepared sheets, they need to dry out slightly before baking. Take note of the weather on the day that you plan on making macarons. Don't make them on a rainy day. They don't dry properly and the texture gets out of whack. And as unfortunate as making macarons is on a beautiful day, just think of all the people you'll impress with your new found baking prowess! I buy almond flour in bulk and store it in my freezer to keep from going rancid. When I need to use the flour, I take out the required amount, break any large clumps and allow to warm to room temperature for an hour. This recipe should net about 50 completed macarons depending on how large you pipe them. I tend to enjoy smaller than usual macarons. My ideal circle is 1-3/4" in diameter. I print this template on 11"x17" paper and place it under my parchment lined baking sheet to use as a guide while piping. Onward to macarons! And if they don't turn out the first time, don't sweat it. Like everything they take some practice, you'll be a pro in no time! Even the ugly (or not so perfect) ones still taste delicious! This is a very basic recipe that can for sure be improved on! Be adventurous! I'm thinking chocolate shells with a raspberry buttercream or chocolate shells and a matcha buttercream, or even chocolate shells with a marshmallow whipped cream. Oh the possibilities! You will not be disappointed. Macarons are best made with aged or dried egg whites. I separate the eggs the night before and leave the egg whites on my counter in a bowl covered with a paper towel. Chocolate ganache can be made a few days in advance. Chocolate shells can be made in advance if stored in an airtight container in the refrigerator. Macarons are always better to overbake than under. An underbaked macaron may stick to the parchment paper. If unsure, add 30 more seconds to the bake time. A scale is highly recommended for this recipe. Make ganache: using knife, finely chop dark chocolate and place in heat proof bowl. Heat heavy cream over medium heat until just beginning to boil. Pour boiled cream into chocolate in three parts, stirring well with each addition. Gradually add small pieces of butter and stir until emulsified. Pour into shallow dish and cover with plastic wrap, directly on surface of ganache. Cool ganache at room temperature and refrigerate until firm enough to be piped, about an hour. 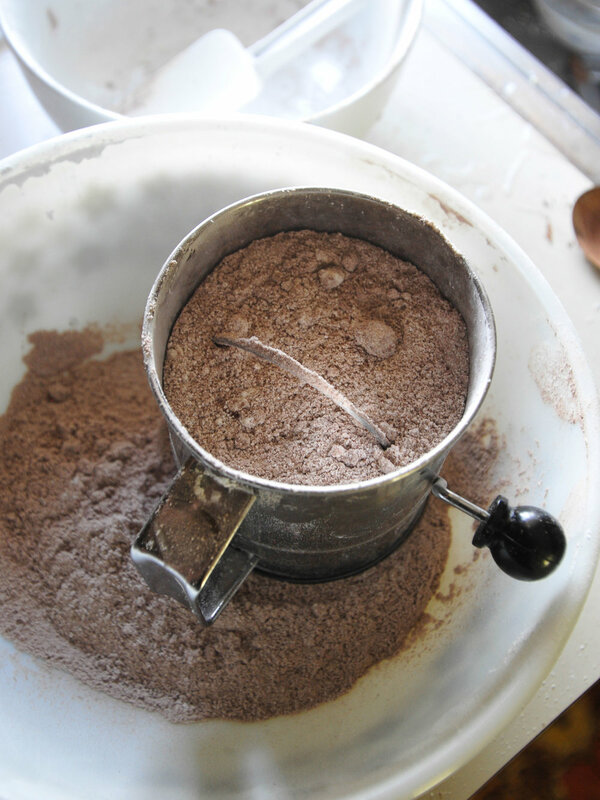 Make chocolate shells: place sifted almond flour and powdered sugar in a bowl. Add in cocoa powder. Sift mixture together at least three more times to aerate and remove any lumps. Mound the almond flour mixture and make a 4-inch well in the center. Pour in 82 grams (1/2 cup plus 1-1/2 tablespoons) egg whites and combine with a spatula. Set aside. Place the remaining egg whites (90 grams or 1/2 cup plus 2 tablespoons) egg whites in the bowl of clean stand mixer fitted with the whisk attachment. Combine the 236 grams of sugar in a small saucepan. Pour water in pan careful not to splash sugar on the pan edges. Heat water/sugar mixture on medium/high heat until the syrup reaches 203°. Turn syrup to high and continue to cook on stove. Turn mixer on medium low. Once egg mixture begins to foam put in pinch of sugar and pinch of cream of tartar and turn to medium/high, whip to soft peaks. If the whites reach soft peaks before the syrup reaches 248°, reduce mixer to lowest speed to keep the egg whites moving. When the syrup is 248°, about seven minutes later, remove pan from stove and with mixer on low, slowly pour hot syrup into the mixer. Aim to pour the syrup in the spot between the side of the bowl and the whisk. 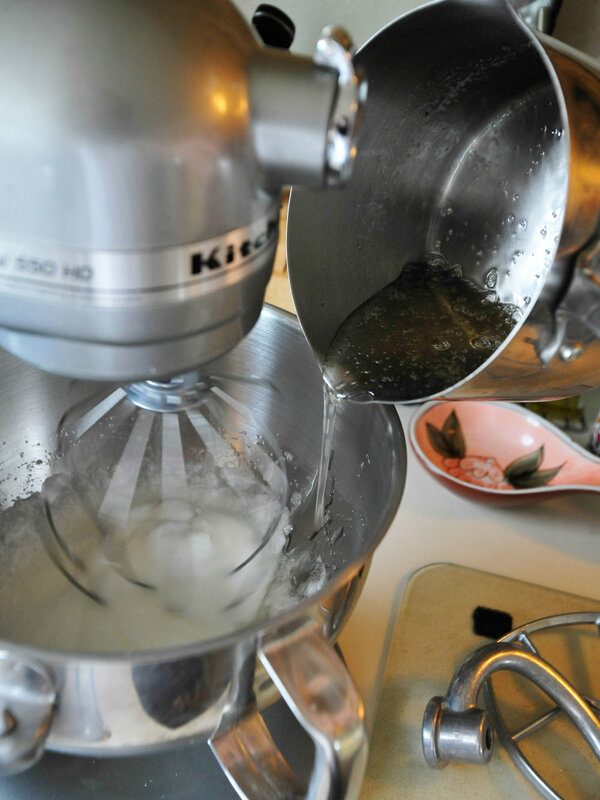 Increase the speed of the mixer to medium/high and whip until the whites are stiff and glossy, about five minutes. When ready, the meringue should be cool and the mixer bowl should be slightly warm. Fold one third of the whipped meringue into the almond flour mixture. Continue adding meringue and fold until incorporated with no white streaks remaining and the mixture is lightened. Using spatula, continually fold mixture over itself. Stop folding when the mixture forms a distinct "ribbon" that holds it shape for a moment when folded onto itself before dissolving into the rest of the batter. You may not use all of the whipped meringue. Transfer mixture to a pastry bag with a 1/2" tip. I use a Wilton #12 tip (roughly 5/16"). Pipe onto parchment or Silpat lined baking sheets. Pipe in one swift motion and swirl the end slightly. Once entire sheet is piped, lightly tap baking sheet on counter a few times to release any air bubbles. Use finger to smooth out any residual tip marks on the surface of the macarons. Lightly dust piped macarons with cocoa. Let macarons dry on sheet for minimum of 15 minutes until surface is no longer sticky and macarons develop a very slight dry skin. Heat oven to 350°. Place sheet in middle rack of oven and immediately reduce oven to 325°. Bake for 10-13 minutes until tops are set and crisp. Macarons should have developed their signature "feet". If you push slightly on the macaron, they should move only slightly and should sound hollow when tapped. Preheat oven after every batch. Cool macarons on the baking sheet for 5 minutes and remove immediately to a wire rack to cool completely. Remove ganache from refrigerator and let warm up at room temperature until spreadable. Transfer to a pastry bag with same 1/2" tip and pipe onto cooled shells. Top with second cookie and press gently to spread ganache to edges. Repeat with remaining macarons. Place sandwiched macarons in refrigerator for a few hours, serve lightly chilled or at room temperature. Completed macarons will taste best 24 hours later because flavors and texture have had time to develop.